Paul Ryan’s poverty plan: Should the whole safety net be designed to fix chronic poverty? Should We Redesign the Entire Welfare State to Fix Chronic Poverty? 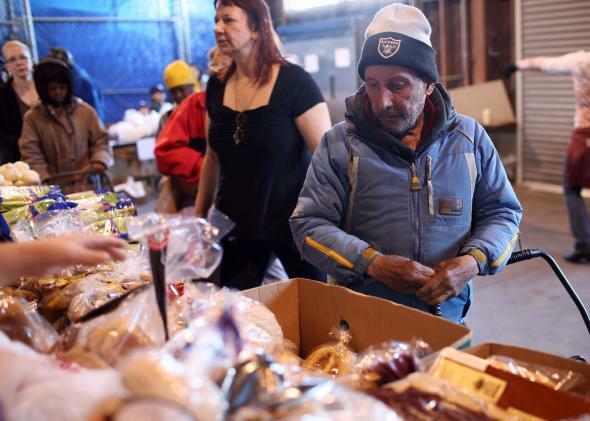 Customers at a food bank in Alameda, California. At Bloomberg View, Megan McArdle writes that my colleague Jamelle Bouie and I are off-base in our criticisms of Paul Ryan’s rather paternalistic anti-poverty proposal, which we both think is overly focused on addressing the needs of the chronically poor, even though most people who experience poverty escape it after a relatively short period of time. Her point is generally about budget math. Most people might not linger in the safety net for long, she argues, but Washington likely spends most of its aid dollars on those who do. I’m oversimplifying a bit, but think of it as a reverse version of the 80/20 rule, which says 80 percent of a business’s profits will come from 20 percent of its customers. A few families in deep long-term poverty are most likely going to consume a disproportionate share of the government’s aid dollars. So, mathematically, I think the argument being made by Bouie and Weissmann fails; it obviously makes a lot of sense to focus on the group that generates a disproportionate share of our entitlement spending. At the very least, we should consider the strong possibility that those struggling with chronic poverty might need very different kinds of help than those dealing with a temporary income problem – rather than suggesting, as Bouie does, that we should obviously focus on doing whatever is best for people having an acute poverty episode because they’re the majority. McArdle admits that we don’t actually know what percentage of government aid goes to the chronically poor, but her assumption that they consume a lot of it is probably sound. But that doesn’t amount to a defense of Ryan’s plan. If your overriding policy goal is to shrink federal spending over time, then yes, drastically redesigning an enormous chunk of the safety net in order to (maybe) move a relatively small group of people who seem to be stuck in intractable poverty toward work might make sense. Ryan’s plan would crunch up to 11 different programs into one, then require each beneficiary to meet with caseworkers and sign a contractually enforced life plan outlining how he’s going to get a job and get off the dole. It’s a radical re-envisioning of how the U.S. welfare state should work, and the only way to really justify it is if you think our current approach to poverty is so ineffective and expensive that we ought to scrap it and start from scratch. But if your policy goal is, instead, simply to design a safety net that works for most Americans who come into contact with it, and cost isn’t your No. 1 worry, then burning down and replacing the one we have is just rash. Nobody thinks the U.S. welfare state is perfect. Pieces of Ryan’s big idea might even improve it. Would it be nice if poor Americans could go to a single office for all their benefits? Absolutely. Could funding caseworkers tasked specifically with helping the chronically poor be useful? Sure. However, the majority of poor people aren’t in dire need of adult supervision. To completely redesign programs that already work well (such as food stamps), while forcing every single person who needs a hand through a rough patch to submit to a new and intrusive bureaucratic regime, is simply overkill. Doing so might not even move many people out of poverty and could have any number of unintended consequences. (Would anybody be shocked if having to sign a life contract scared off some poor parents from trying to get benefits that they really needed?) Looking for specific places where the safety net is weak, and then fixing it in a targeted way, is the more responsible choice. Ryan’s defenders, including McArdle, point out that he only wants a pilot program so that a few states can experiment with his approach. But remember, these aren’t lab experiments. We’re talking about lives and livelihoods. We ought to be careful with them.